Water security is far too important to put at risk! The Premier agrees - see his promise to ban mining in catchments here. He wouldn't break a promise would he? Fossil fuel and mineral mining and extraction inescapably entail risk and risk taking in our vital water catchment areas is not in the public interest. 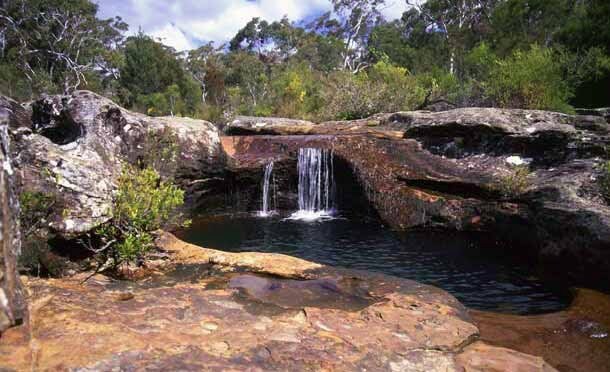 Save Our Water Catchment Areas (SOWCA) is a multi-group supported campaign to halt harm being done to the water catchment areas of NSW by coal seam gas (CSG) extraction, coal mining and any other damaging and hazardous mining and mining related activity, including exploration. Exploration is in effect the first phase of establishing a production operation and its impact risks must be assessed in that context. Remarkably, the Strategic Regional Land Use Policy being developed by the NSW Government does not currently include water catchments in its strategic land classification. The Government's top seven priority regions for their land use assessment in NSW are the Upper Hunter, New England North West, Central West, Southern Highlands, Murrumbidgee, Alpine and Western regions. So not only has the Government overlooked the importance of water catchments in its strategic land use review, it has overlooked the main catchment areas supplying water for the nearly 5 million residents of Greater Sydney and Wollongong - the Northern Illawarra and Wollondilly catchment areas for Greater Sydney are not listed in the first priority regions. In principle at least, key areas in the catchments of Greater Sydney are protected by legislation passed in 1998 by a forward looking Parliament. The legislation declared protection zones around the principle dams and reservoirs of the region, including the Avon, Cordeaux, Cataract, Nepean, Woronora and Warragamba Dams.. These zones are known as Special Areas and are managed by a statutory agency created for that purpose - the Sydney Catchment Authority (SCA). The reality of the Special Areas is not as it should be - Government has allowed coal mining to continue to expand under the Special Areas and has approved CSG exploration. For instance, of sixteen approved CSG exploration bores in the northern Illawarra, eleven are on SCA managed catchment lands. So a subsequent production field is likely to be primarily on SCA managed lands. As population grows and climate change progresses, water security is increasingly important. No responsible Government would allow the kind of risk taking associated with mining in key water catchment areas. Its time to stop! No more damage, no more risks; our water security is too important!! 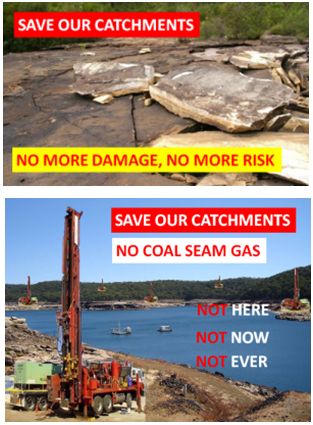 The SOWCA campaign calls on the NSW Government to halt and exclude coal and CSG activity in the SCA Special Areas and other key water catchments in NSW. Catchment image graphics from an idea suggested by Natasha Watson.